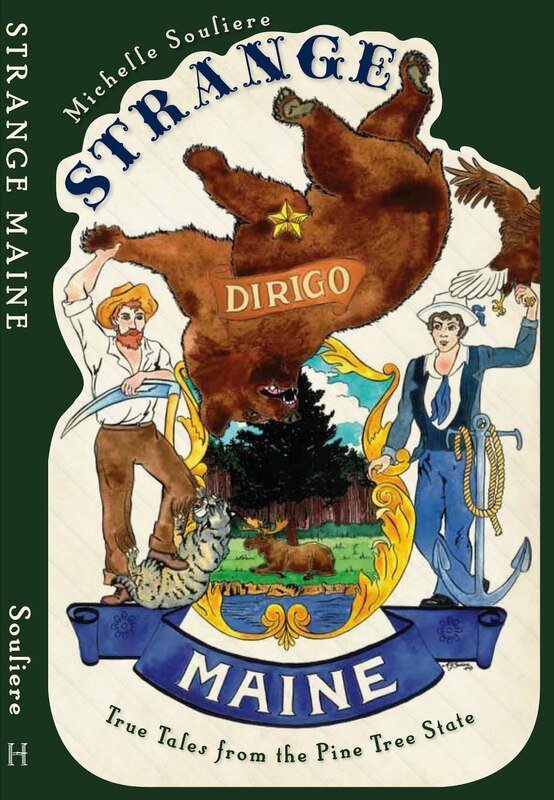 I blogged Monday at All Things Maine about the Scythe Tree of Montville. Martin Van Buren Hannan was out mowing a field with Levi Bartlett in 1862 when a recruiter came by. Mart recalled that after the Recruiter left, Levi and the farm help went back to their task of mowing the field, swish, swish, swish. Mart was a strong young man of twenty-two years, able to keep up the hardiest of his friends and neighbors, and able to do a long, hard day’s work. The words brought by the passing messenger echoed in his ears. It shouldn’t take long to whip the Rebels, and keep the country strong and secure. The scythe still hung from the maple when he returned from the war, and what remains of the blade is undoubtedly still there, embedded in the wood. Trees can swallow up bullets, nails, barbed wire—even gravestones, given enough time (here's a Flickr pool featuring items "Eaten by Trees"). My father used to sharpen saws at a mill, and repaired the damage that hidden pieces of metal inflicted. The most impressive example was an entire peavey hook a tree had grown around. Out in his barn he keeps a section of that log with the hook still inside. A followup on our earlier post about strange lights reported by multiple witnesses in Maine the other week -- it looks like it was the Vermont Air National Guard, of all things. What the heck are they doing here? Nevertheless, the events produced a wide range of sightings, and mightily impressed everyone who heard their tales. It was a real experience. Please note that a commenter has left their eyewitness account of the events on our earlier post. Please read it, it's very interesting. ANSON -- It was about 7:30 Wednesday night when Gehri Rinaldi took time out from her son's 14th birthday party. She went outside to the front porch and lit a cigarette. That's when she saw the strange lights in the sky. In all directions. By the time the UFO show was over, Rinaldi and her son, Dalton Mosher, had seen weird, inexplicable sights. "I saw four of them in a row, and I went, 'wow,'" Rinaldi recalled. "The lights were reddish-orange. I called Dalton out. We looked left and saw two more. And then we saw them going through the trees. That's how low they were." The family's experience was one of at least four reported Wednesday -- all at about the same time and in the same general area -- to the Somerset County Communications Center. There might be an explanation in the form of the Vermont Air National Guard. Marie Endsley, Vermont Air Guard spokeswoman, said a unit did practice maneuvers in Maine on Wednesday night with three F-16 jet fighter planes. The training mission could explain the lights that several residents reported seeing fairly close to the ground. "We were conducting our normal training missions and were flying through there," Endsley said. "They were for a short period of time." Endsley said F-16s now fly lower than 7,000 feet. Flares, she said, might look reddish-orange, but would disintegrate well before hitting the ground. Tom Hawley, a meteorologist with the National Weather Service in Gray, said there were no weather-related conditions Wednesday night that could have caused such sightings. Other calls came from Skowhegan Road in Fairfield, Main Street in Norridgewock and Norridgewock Avenue in Skowhegan. The Fairfield caller reported seeing "strange lights in the sky heading south," while the Skowhegan caller reported seeing yellow lights in the sky over Skowhegan. Somerset County Sheriff's Deputy Richie Putnam took the calls from Anson and Norridgewock. Putnam said neither the Federal Aviation Administration nor the Brunswick Naval Air Station reported any flights in the area. "(People) were seeing streaks of white light, and it wasn't anything that they recognized," Putnam said. Rinaldi, who moved from Arizona to Anson only three weeks ago, tried in vain to photograph her close encounter with her 35 mm camera, but it jammed. "It worked for me inside the house, for the birthday party," she said. "It shut itself off outside. It would not take a picture." Rinaldi also said she saw one UFO that streaked sideways over the sky, like a comet. When she went inside to check the camera, she heard her son hollering. "Mom, Mom, there's more!" Dalton Mosher yelled. By that time, Mosher recalled, he was getting a little scared -- especially when he saw lights moving through the trees. "There were a bunch more," he said. "One just shot across. It looked like it had a tail on it. I was just scared. I didn't know what to think of it." Gehri Rinaldi said she doesn't spook easily. "The part that startled me the most was when I went back out 30 or 40 minutes later to have a cigarette, and all the dogs were howling," she said. UFO sightings were reported a week ago in the Farmington area. Lt. Niles Yeaton of the Franklin County Sheriff's Department said he thought they were flares from military planes in training. People in the area have heard low-flying jets at night, Yeaton added. Somerset County Sheriff Barry A. DeLong said he doesn't dismiss stories of UFOs, because he has seen one. It happened back in the 1970s, when he was on patrol one night in Bingham. "I didn't want to talk about it," DeLong said. "I didn't want people to think I was crazy." DeLong said the lights he saw were not far from the ground. "They were hovering about 15 feet from my cruiser, late at night," the sheriff said. "It had fixed lights that were spinning. It was huge, and oval-shaped. I knew it wasn't a jet fighter. It slowly started backing off toward Sugarloaf, and then at a terrific speed." 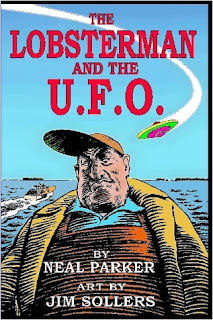 Maine has a long history of UFO sightings which I'm hoping to sit down and survey in total at some point soon. Meanwhile, here is a more dubious one from way back in 1958, at Timber Lake, where a troop of Boy Scouts took some photos of a very strange object in the sky. Click here to view photos and account of the sighting. Well, I've gotta say that getting Friday off from work and going down to Biddeford to slave myself to the zombie masters of Emptyhouse Films was about the best thing I've done yet this year. I've put up a ton of behind-the-scenes photos here on my Flickr.com site. Go now, and feast your eyes on this magnificent horror! I spent about 6 hours doing makeup, putting white Mehron liquid base foundation on I'd guess around 20 zombies (I seriously lost count). My job was to make sure no sign of living flesh remained -- not an ear, not a neck, not a face, not a hand, certainly not an arm, and not even cleavage. It was a really interesting and gruelling experience. Ross and Kristina did all the fancy stuff -- he put on latex and flesh wounds and basic toning, while she finessed everything and added final shading, blending, and other effects. They kept up with the demanding pace and really worked their fingers to the bone. Bob Dipitriantonio did his own makeup on the remaining segment of the zombies, applying facial appliances to them and generally making some really gross messes out of their formerly pleasing faces. Yech! Chris Wallace was there all day Saturday when 80+ zombies were rampaging about. She took a ton of great photos and posted many of them on her Flickr.com site as well. Many thanks to Andy Davis and Olin and all the rest of the Emptyhouse Film crowd for fostering such an open and accessible filming experience, and to all the actors and crew who really made the days come together as a whole with all their hard work, even in the most FRIGID of temperatures! 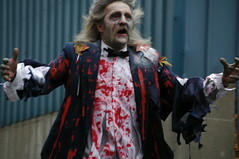 Ross Kearney lets us know that all is well in the land of zombie filmmaking. All photos by Michelle Souliere. More reports of strange lights in the sky—this time in Somerset County. ANSON -- It was about 7:30 Wednesday night when Gehri Rinaldi took time out from her son's 14th birthday party. She went outside to the front porch and lit a cigarette. That's when she saw the strange lights in the sky. In all directions. The Vermont Air National Guard was conducting practice maneuvers in the area on Wednesday, but Somerset County Sheriff Barry A. DeLong hasn't ruled out UFOs. He's seen one before. When I was a young teen, my sister two years older, my papa (grandfather) took us and my grandma into the woods up on the ledges of lake megunticook. 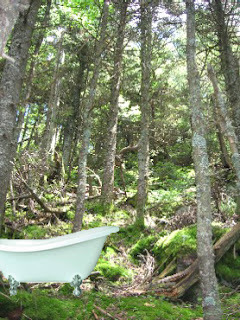 While up there, high ontop of the thick wooded area, we came across...ok...I really am telling the truth...my sister and I saw a indian sitting in a porcelian bathtub taking a bath in the middle of the thick branched forest. My papa seemed as shocked as my sister and I were. My grandma was speechless. I don't remember her saying a word at all. My papa got me and my sister outta there as fast as he could. I will never forget seeing that. To read the full post by Valerie Wass, click here. Paper Rock Scissors - Zombie Fire Cold? Luckily this was a small cast day -- imagine the logistical nightmare if it had happened on Saturday, when over 80 made-up zombies were lurching around on the set with a gigantic filming and effects crew on duty. The three alarm fire soon had the mill yard surrounded by fire trucks, as the crew and the rest of us hauled all the equipment and make-up supplies out of the facilities to relative safety on the other side of the parking lot, and then again further around the corner as more trucks came in. We tried to make friends with the wind chill factor, but it was a difficult diplomatic manuever that failed for the most part. It soon became clear that shooting was a washout for the day. I asked Andy Davis, writer/director of the film, if this was the craziest thing he'd had happen during his years of filming movies, and he grinned and said no, crazier things had happened for sure. I'll try to sit down with him later and do an interview on just how crazy things can get when you're an independent director shooting on a budget and on a tight schedule, and you are at the mercy of the world. The expensive filming equipment and a handful of props were loaded onto a pickup truck, as most of the cast and crew's vehicles were trapped behind a yellow line of police tape under the fire crew's watchful eyes. The half-made-up zombies, including myself, dispersed to their respective homes, some as far away as Union, Maine (hi, Barbara and Jack!) after their vehicles were freed up, some almost an hour later. News reports this morning stated that the fire occurred in a woodshop on the lower level of the mill yard. I found some online video, etc, about Saturday's mass zombie filming, and Monday's fire, on a few different sites. News-8 WMTW (ABC) has a writeup and video covering the fire, click here to see it. That report includes a short interview with Barbara Tibbetts, hooray Barbara! Portland's WCSH-6 (NBC) has some video available. You just need to search BIDDEFORD MILLYARD on their main site, and you will pull up a number of reports, including two pertinent ones with the titles "Fire Breaks Out at Biddeford Millyard" and "Movie Filming Attracts Zombies to Biddeford." To read more about the Riverdam Millyard, which has become a hub in the fight to revitalize the Saco River district's old buildings which are rife with potential for new uses, and to read more about Steve Sobol, the man that is making this happen in spite of the odds, please click here to view a PDF of a Press Herald article about the millyard which includes color photos and various interviews. The Chick Hill Pollution Control Facility in Rangeley has a novel way of storing its not-quite-clean wastewater over the winter. Using ski resort-worthy guns, the treatment plant here makes snow out of millions of gallons of treated - but not disinfected - wastewater. The wind up here blows something fierce. You go outside and lick your lips, it's probably going to be salty, warns Superintendent Jerome "Frenchie" Guevremont. Don't put too much thought into why. Some issues have arisen in the Auburn trial of Daniel Roberts that go beyond the existing concerns with juror responses to screening queries by lawyers from both sides. The Lewiston Sun Journal reports, "After the jury was dismissed at the end of the day, Justice Joyce Wheeler told those attending the trial that some of the jurors had become aware that people in back-row seating were staring at them, apparently making them uncomfortable." The Sun Journal goes on to remind readers that "Roberts was once leader of a local Hells Angels chapter." Yeah, the possibility of that type of thing might make the jurors, and the judge, a little nervous. Here's something that doesn't happen everyday! The quantity of reports from Mainers in a wide range of towns within the area make this particularly interesting. From the Lewiston Sun Journal, of course. This hearkens back to some similar events back in November and in October of 2006, in Industry, Maine, and Skowhegan, Maine, respectively (click on links to read the original posts). FARMINGTON - Strange lights with no obvious cause were spotted all over northern Franklin County Tuesday night, Sheriff's Department dispatchers said. "The phone was ringing off the hook," dispatcher Bill Hoyt said. Multiple callers from multiple towns - New Vineyard, Wilton, Phillips, Industry, and around Mt. Abram - called to report bizarre, low-to-the-ground lights, he said. "They were seeing, basically, a string of seven or eight lights low in the sky, that were fixed," he said. "There (were) also reports of jet engine noise low to the ground." One person who called worked with jet airplanes, Hoyt said. "They were not like any lights he had ever seen." Some people said they looked like stars. Hoyt called a Federal Aviation Administration office in Boston, which monitors air traffic in this part of New England, wondering if what people saw and heard could be related to military exercises. "They said the only air traffic was a couple of routine air flights at 40,000 feet," he said. Hoyt doubts it was aliens. "I think, personally, most of the time there's an explanation for everything," he said. "But you know, I don't deny the fact that people see things they can't explain." "It was kind of odd," he said. "All these reports were from different locations at the same time. Maybe it was a meteorite." The jet-engine sounds and the fixed-ness of the light pattern make him question that theory, though, he said. Some witnesses posted responses to the article online, recounting their experience that evening. Jeanne said, "I also saw the lights as I was leaving Edmunds store in Phillips. At first I thought it might be the big dipper. There were 7 or 8 big bright lights in a half moon quite low and then all of a sudden they were gone. Also I heard sounds of jets but these lights were way too low for jets. when I got out of my vehicle I saw another big bright light and it also disappeared." Another poster, Audrey, comments, "I first saw the activity in the sky driving north of Belgrade and then again in New Vineyard. Almost as quickly as I could count the number of objects( at least 9) they would disappear. When I arrived in Kingfield and stepped out of the car I could hear what appeared to be airplane engine noise but did not see any further unusual lights." The other commenter, Kingfielder, gave an even longer response: "I heard jets last night, like you often hear when they are doing maneuvers/practice, and I also saw a bright light in the sky at one point, and thought, 'if that's Venus it's a lot brighter than I've ever seen it... and it's in a different place.' Then, the light went out. I put my coat on and went outside and did see four or five lights (accompanied by the jet engine sound) flying around at different speeds and heights, both close and in the distance. With rapidly blinking white lights most of the time, and sometimes no light visible but just the roar of the jet. I also saw more of the same bright yellow lights (like a bright yellow moon, but maybe 1/20th the size), sometimes these lights were moving and sometimes appeared on the horizon as stationary. Perhaps moving away from me, but hard to tell. This went on for about a half an hour. The last I saw of them, they all headed toward the southwest (from Kingfield) and didn't return." Actually, it's a donkey. But the comparison has been made! 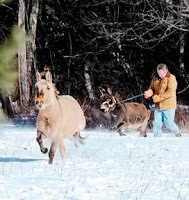 PITTSFIELD (AP) - An exasperated farmer has tried for weeks to corral his runaway donkey. He tried coaxing her. He tried tranquilizing her. He even tried using a horse whisperer. But Jenny the donkey has proven to be elusive, evading capture and enduring bitter cold during the past three weeks on the lam. Varricchio and Mary Gaeta decided to buy Jenny two months ago because they'd heard that having a donkey around the farm would ward off predators like fox, coyotes and raccoons that have been snatching 50 to 60 hens a year. But this donkey had a mind of her own, fleeing the corral on Jan. 18, a couple of weeks after arriving at the farm, called "Mary's Gardens." Varricchio said his son shot Jenny with a tranquilizer dart, but she ran away into the woods. Apparently it had no effect, because she was up and about when they located her two hours later, he said. They tried putting tranquilizers in her food. That didn't work, either. Lewis said Jenny might be wandering on 30 acres of woods behind the farm because she's searching for her mate, from whom she was separated at an auction. Her donkey buddy is now believed to be residing somewhere in New Hampshire. It's not easy catching a critter that doesn't want to be caught, Lewis said. "It's kind of like chasing a 700-pound rabbit," she said. Maybe someone can get those two back together for Valentine's Day, eh? Holey moley... although after seeing the photo, all I can say is it's like the whole "How could everyone look at Clark Kent and not know he's Superman?" thing. How could anyone look at the photo of Joe Hill that accompanies this USA Today article and not see Stephen King's son? However, those who were previously operating under this information could have easily been fooled (see image at right). Wow, guys. He did it. He made it on his own and now the secret is unfurled. Click on this link to read the full article. Thanks to Tracy at Haunted Maine for tipping me off on this one. King of the hill: Joe Hill is getting good reviews for Heart-Shaped Box. NEW YORK — On meeting Joe Hill, it's easy to see the resemblance — in the eyes and thick eyebrows — between him and his father, the master of literary horror, Stephen King. For the first time since he began writing short stories a decade ago using a pen name, Hill is revealing his identity and discussing his biggest literary influence: his dad. The occasion is the publication of Hill's debut novel, Heart-Shaped Box (William Morrow, $24.95), out Tuesday. It's a supernatural thriller with an avenging ghost and a fiftysomething heavy-metal musician whose hits include "Happy Little Lynch Mob." The rock star collects macabre items, and when he hears of a ghost for sale online, he buys it — or at least the dead man's suit. Most reviews are good. The New York Times calls it "a wild, mesmerizing, perversely witty tale of horror." The author's real name is Joseph Hillstrom King. 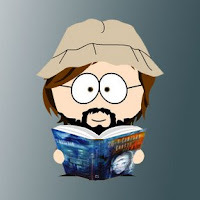 But at 34, he says he never wanted to be introduced to agents, publishers or readers as "the son of Stephen King." Heart-Shaped Box (the title of a Nirvana song) began as a short story, prompted by what Hill calls a "vigorous trade in occult and macabre items online." His interest was "not who's selling this stuff, but who's buying." It's a mistake, Hill says, "to conflate an author's characters with the author himself." He describes a dream childhood in Bangor, Maine: "Both of my parents stuck around and stayed emotionally and intellectually involved with their kids, and I received a top-notch education, in spite of my efforts to sink straight to the bottom. I can't complain. If I do, someone please chuck a brick at me." Variety broke the news that Hill was King's son in April, when the movie rights to Heart-Shaped Box were sold to Warner Bros. The article noted that when the deal was made, studio executives didn't know Hill had a famous father. Hill's agent and editor say they worked with him and admired his work before he told them who he was. What? Filming of mass zombie scenes for "2"
Who? Everyone who has ever wanted to be a zombie. How?No need to do your makeup, they'll be ready for you. Wear clothes you don't mind getting gory. ZOMBIES! ZOMBIES! ZOMBIES! "2" brings zombies to Biddeford! On Saturday, February 17th over 100 zombies will attack the Riverdam Millyard in Biddeford for the shooting of the zombie horror film "2", a new feature film by Motion Media/John Lane Films/Emptyhouse Film. The film is being co-produced by Olin Smith (Mud, I'm Sorry) and John Lane, who is currently in the pre-production on "The Novice" starring Chuck Norris. "We've been amazed by the response from the public, it really seems like we have tapped into a zombie pipeline of sorts. We've had people come from 3 hours north and south, just to be a zombie in the film. It's been a great experience." said Executive Producer John Lane. "2" is a zombie survivalist film co written by published author Al Lamanda (Dunstan Falls) and Andy Davis (Mud, I'm Sorry). "We are a week away from production on 2. Everything has come together nicely and in many cases better than we expected. We have a great cast and crew and the locations are just mind blowing…and did we mention there will be blood?" said writer/director Andy Davis. "2" tells the story of two survivors of a biological attack that has turned the world upside down and how they deal with their situation. "2" stars C. James Roberts (Mr.Barrington) and Molly Roberts (The Dark). 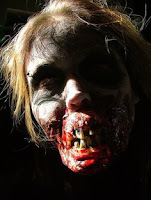 "There is something about zombies that really attracts people to our film. 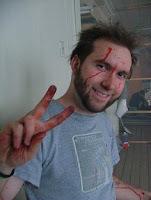 For most of us involved, creating a zombie film is a dream come true. We're pulling out all the stops for this film, from the story and cast, to the locations and effects," said Producer Olin Smith. Zombie extras were pulled from all over New England. On Saturday, they will go through a major transformation under the makeup brush of Robert Dipietrantonio and other talented makeup artists, then will appear in many scenes being shot that day. "2" will be shooting from February 16th-26th in Biddeford at the Riverdam Millyard (http://www.riverdammillyard.com). More Zombies... More, I Tell You!! If you like zombies - and who doesn't - then you will want to keep on top of the news from local filmmakers Emptyhouse Film. Their new movie, "Two", begins shooting at the end of the week. 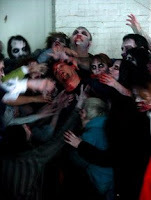 There was a good turn out for the open call for zombies in January. If you missed the well lit zombie head shots - as in photos, not bullet wounds - or you want to check out some photos of the zombies in attack mode, you can check out both sets of photos at this zombie friendly site. BARRE, Vt., Feb. 22 (AP).—Victor Olson was back home Tuesday with his wife and children—wondering who will replace his new suit. Last October, a headless body was found in the East Barre flood dam. Investigators concluded it was Olson's and his family agreed. The body was buried after services Oct. 12—in Olson's best suit. Later Olson was located working in a lumber camp in Bethel, Maine. No one has been able to identify the headless body. MACHIAS (AP) - A weary traveler who had 80 bags of suspected heroin with him learned the hard way that "You snooze, you lose." Brian Nowick, 38, of Springfield, Mass., was awakened from his slumber on a bus to find himself in the presence of a police officer. Police said they searched him and found heroin and a substance believed to be cocaine after realizing he was wanted for a warrant out of Cumberland County. Nowick, who was arrested Monday, remained in Washington County Jail on Thursday. It's not a crime to sleep on a bus, but Nowick was unresponsive when the bus rolled into Machias. "He wouldn't wake up," said Assistant District Attorney Joelle Pratt. "A woman beside him couldn't get out of her seat." When he did wake up, he gave a false name, police said. He told police he had planned to visit a friend in Machiasport. Yep. Brilliant, I tell ya. Last year a lynx was discovered dead in late December. New information has come to public light in an announcement about the killing and its heinous circumstances. You can find this article on the Lewiston Sun Journal's website here. PORTLAND (AP) - The U.S. Fish and Wildlife Service is investigating the shooting death of a Canada lynx in northwest Maine last year. The carcass was recovered Dec. 20 near Third Musquacook Lake in Township 11, Range 11, but wildlife agents believe the animal was shot several days or weeks earlier and traveled some distance before dying, officials said Wednesday. The shot amputated one of the lynx's rear legs and the animal eventually starved to death, said Special Agent Robert Rothe. 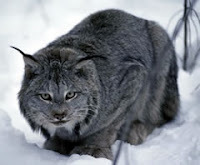 The male lynx was equipped in 2000 with a radio collar as part of a Maine Department of Inland Fisheries and Wildlife study. The lynx is listed as a threatened species under the federal Endangered Species Act. The federal penalty for killing a lynx is a jail sentence of up to six months and a fine of up to $25,000. The U.S. Fish and Wildlife Service is offering a reward for information leading to the arrest of the person responsible for the shooting. The lynx has been a bone of contention in Maine. Just last September, the Animal Protection Institute filed a lawsuit against the state of Maine in an attempt to end trapping practices that they view as violations of the Endangered Species Act, which protects the lynx. Read the API press release here. See full article on the Lewiston Sun Journal site here, including photos. OTISFIELD - Marijuana plants found growing last fall on an Otisfield man's property landed him in hot water with police. But it was the incidental discovery of illegally stocked bass in his ponds that netted the bigger penalty. On Dec. 14 in 11th District Court, Nicholas Palmer, 23, pleaded guilty to cultivating marijuana and illegally stocking fish in a private pond. Judge John McElwee fined Palmer $250 for growing 52 pot plants, and $1,000 on the fish crime. "I can understand why they'd fine him stiffly for the fish, because bass are aggressive and would go after trout if the ponds flooded into other waters, but $250 for the pot?" Oxford County Sheriff's Cpl. Chancey Libby asked Thursday afternoon by phone in Paris. It also didn't come close to covering the amount of time and effort that Libby and other officers put into the cannabis case after being tipped off to plants growing on both Palmer's Ahonen Road property and his neighbor and uncle, Stephen Holden's property, Libby said. On Sept. 22, Libby had a certified drug spotter in a Maine Army National Guard helicopter fly over both properties looking for pot plants, while he drove into Palmer's yard to question the man. But before he reached the front door, Libby said he saw pot plants growing beside the house. He then sought and served a search warrant for both properties, finding 52 well developed marijuana plants at Palmer's house and 47 pot plants in and around Holden's house. Holden's case is pending because he's contesting the cultivation charge, Libby added. Cranky Yankee over at the New England Anomaly caught this Maine crime story, which shows up in today's Lewiston Sun Journal (click link to read full story). The latest item being snatched from cars and trucks has unsuspecting motorists scratching their heads. The targeted vehicle may look just fine but the exhaust lets out a NASCAR-like roar when the operator turns the key. It turns out thieves are crawling under vehicles and cutting away catalytic converters, making them a hot commodity in more ways than one at scrap yards. In Bangor, medical secretary Karen Thompson found out the hard way when she was summoned by hospital security to the parking lot, where someone had cut away the converters from several vehicles including her 2006 Toyota Tundra pickup truck. The telltale evidence came when she started it. Because someone had sawed through the exhaust pipe, the truck rumbled as if there was no muffler. "It was really, really loud. The rearview mirror shook," Thompson recounted. The cost of replacement and repairs at her local Toyota dealership was $2,100. Thieves tend to target sport utility vehicles and pickup trucks because they don't have to be jacked up. They can simply slither under the vehicle and saw away the catalytic converter within minutes, investigators said. In Bangor, the thefts from a busy hospital parking lot that's patrolled by security staff illustrate the ease with which converters can be stolen. Thompson remains incredulous that someone managed to crawl under her truck and cut away part of her exhaust system without attracting attention. "It was pretty gutsy to do it in broad daylight," she said. Police say it's hard to nail a thief unless they're caught in the act, and that's what happened last week across the river in Brewer. Police received a report of a theft behind an auto repair shop. The thieves were gone by the time police arrived but the getaway car had backed into a snowbank and left an imprint of the licence plate, said Brewer Police Detective Sgt. Jay Munson. Brewer police used the license plate number and tire impressions in the snow to track down the car and secure a search warrant. Inside, investigators found two battery-powered saws, a portable jack and three catalytic converters, Munson said. I guess we can't count on all of them to leave their license plates imprinted on snowbanks. Good job by the Brewer Police, catching that well-hidden clue! So keep an eye out... those puppies are expensive to replace, and all the jerks who are stealing them are paying for them with an easily fixable wet rear end from shimmying in and out from underneath your vehicle. KABLOOIE!!! Deer in the face! As usual, thanks to the New England Anomaly mailing list for this little beauty. Apparently deer aren't content with wrestling, now they're trying to horn in on some skiing action too! CARRABASSETT, Maine -- Dr. Ray Stone had no warning before he was knocked off his feet last month while skiing down the Haulback Trail at Sugarloaf/USA. "My first thought was, 'What hit me? ... a (snow) boarder? drunk skier? linebacker?'" Stone wrote in a letter to The Irregular, a weekly newspaper in Kingfield. It was none of the above. A whitetail deer attempting to cross the trail crossed paths with Stone as he was making a turn. "I just never saw this deer coming," Stone said Friday. "I was going pretty quick down the top half of Haulback, arcing from left to right and all of the sudden I just got knocked right off my feet and I was falling." The deer also went down. "Its legs were just pumping away really fast, they never stopped moving," said Stone, a family practice doctor who lives in New Gloucester and works at Central Maine Medical Center in Lewiston. The collision was witnessed by skiers riding in a chairlift, said longtime Maine skier and ski writer Dan Cassidy, whose story about the incident eventually prompted Stone to write in that he was the skier who hit the deer. Cassidy, who has been skiing in Maine for 45 years, said he had never before heard of a deer-skier collision. "Never, never, never," Cassidy said. "I've never even heard of anybody encountering a deer on a ski trail, especially an alpine trail. I've seen an animal, like a fox, come out on occasion but never a deer." Stone recalled people hollering at him from the lift, which prompted him to raise his fist and pump it in the air to let them know he was OK. He then skied down to meet his wife, Diane, at the chairlift. She was skiing ahead of him and hadn't seen the collision. When he told her he had just run into a deer on the slope her first question was, "Is the deer all right?" Stone said the deer quickly bounced back to its feet and continued across the trail and into the woods. "It never stopped running even though it was down," Stone said. "Luckily we just glanced off each other. I'm just glad the deer wasn't hurt." New England Curiosities Walking Tours is heading indoors for a winter event in nearby Cape Elizabeth. The event is a little pricey compared with most ghost tours, but the ticket includes a "five star dinner" which is uncommon in this trade. "Investigation" might be a strong word to use, judging from the description of the evening, but it sounds like a pleasant way to spend a few hours on a wintry February evening for any ghost story lovers out there. We are now accepting reservations for "Dinner With the Ghost Bride and Investigation With The Ghost Project." This three hour paranormal investigation and dinner will stir your imagination and send shivers down your spine. 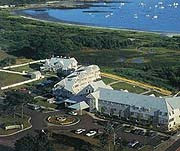 Join us for a haunted evening at the beautiful and elegant Inn By The Sea in Cape Elizabeth, Maine. A delicious three course dinner is included along with a fascinating tour of the grounds where bride-to-be Lydia Carver is buried in a quaint cemetery. The fate and final hours of Lydia's ship and bridal party will come to life in the location of the shipwreck. Our costumed guide will also take you on a walk along the beach (weather permitting) where Lydia's lost soul is said to wander. Her tragic tale, along with numerous stories of her ghostly presence at the Inn will captivate you over dinner. February 23 at 7:00 pm. Email us to purchase tickets and to place your reservation, space limited. CAMBRIDGE — One minute Matthew Cunningham was watching his wife clean the family’s large fish tank in their home on Route 150 in this small Somerset County town Thursday evening. The next minute he was wrestling with a deer. An approximately 100-pound doe jumped through the family’s parlor window, trotted through the dining room and entered the office where Cunningham, 26, his wife, Lori, 30, and their son, Zeke, 4, were standing. "I heard a large amount of breaking glass and I was trying to figure out what did that, and the next thing I know, he [Matthew] has a deer in his arms," Lori Cunningham said, recalling the incident that happened around 5:30 p.m. It all happened so fast that Matthew Cunningham didn’t have time to think. "I just kind of muckled onto him and pushed him into the bathroom," he said. Dr. Lambricht of Warren was either utterly brilliant or utterly insane. "A German urine-doctor has lately come from Virginia to Warren. The people flock to him by hundreds; his house has been so thronged that some days he could not attend to half the applicants. It has been reported, that he had an hundred people under his care at the same time. Samuel Bennet died at his house. The body was brought to this town, and opened by Drs. Sibley and Harding, to find a great worm which the learned doctor said was in him; but none was to be found. The fellow says Micajah Gleason has a worm as many feet long as Gleason is years old, and that the worm adds one foot to its length every year. He says Gleason has not got asthma. He says he shall certainly cure Mr. Gleason, if he can obtain the aid of a seventh son." The Lewiston Sun Journal reported that a pair of 19-year-old twins were hauled off to the clinker after hucking bagels at eachother in a school foodfight in Hiram, Maine. HIRAM - School food fights usually don't end in arrests, but Friday was an exception when twin brothers were taken to the Oxford County Jail after a school cafeteria incident. Darin and Daniel Hoyt, who turned 19 on Saturday, were arrested around 11 a.m. Friday at Sacopee Valley High School on charges of disorderly conduct and criminal threatening. Oxford County Sheriff's Office Deputy Joshua Wyman, the interim school resource officer, said the two were throwing bagels at each other when a teacher told them to stop. Wyman said the twins "acted belligerent" toward him and threatened his life. They were arrested and later released from the jail on an unsecured bond. "They were threatening everybody and anybody," Wyman said. According to the Hoyt family, however, the incident was blown out of proportion. Darin admitted to throwing a bagel at his brother during a food fight involving other students. After a disagreement with the teacher, he said Wyman grabbed him by the wrist to the point where it hurt. "I told him I'd punch him in the face," Darin said. Daniel said he tried to stick up for his brother, and Wyman grabbed him too. "I didn't even threaten him at all," Daniel said. The best foodfights I ever saw were in the Deering High cafeteria. The gigantic plate glass windows made for some terrific visuals. I was coming down the stairs past the windows when one was going on back in the late 80s, and have very vivid impressions of a number of ballistic foodstuffs. A half pint carton of chocolate milk exploded against the window, and also visible was a stalwart assailant swirling an apple overhead in a makeshift sling made of a plastic produce bag, ready for launching. Ahh, food fights. You Missed National Kazoo Day!!! But the Bangor Daily News didn't. BANGOR - The Anderson family had a long drive ahead of them Sunday night, gearing up for the three-hour journey back home to Van Buren. The family of five, however, will not be listening to hard rock on the radio for the return trip, much to Ralph E. Anderson’s dismay. At 3 p.m. his three children, Tyler, 12, Makayla, 10, and Nicholas, 3, were performing "Twinkle, Twinkle Little Star" on their homemade kazoos made during the Maine Discovery Museum’s celebration of National Kazoo Day. Tyler and Makayla tirelessly hummed into the paper towel rolls decorated with feathers and stickers, each attempting to outdo the rendition of the other. "That’s what you call premature gray," said Ralph V. Anderson, the children’s grandfather, as he pointed to his son’s hair. The eldest Anderson enjoyed poking fun at his son about the impending drive that inevitably placed three kazoo-armed children in the back seat of the vehicle. All joking aside, the father of three said he did not mind the tunes, and was happy to see all his children enjoying the same activity. "This is something we don’t have up there [in Van Buren]," he said. "We come from a family of music, and this is an instrument they didn’t have around." Early Sunday afternoon, about 10 to 15 children showed up to construct the paper towel masterpieces, with wax paper affixed to one end, which kept smiles on the faces of parents and children alike. "When I look at the calendar I look for fun opportunities for kids to learn something," said Trudi Plummer, director of education at the museum. "National Kazoo Day is just one of those weird days that people don’t know about." Please also note that at some time in the past, the King of Kazoo, Rick Hubbard, who travels the country forming kazoo orchestras, came in touch with Maine. 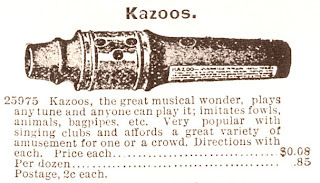 According to his website, "one town in Maine got sponsors to provide kazoos to everyone in town - all 8000 of them." Hmmm... wonder what town that was??? "It’s an environmentally friendly cemetery where everything that goes in [the ground] is biodegradable," said Richard Harriman, Orrington code enforcement officer. "That means [biodegradable] wooden caskets, and if you don’t want a wooden casket, you can go in wrapped in Grandma’s rug or as ashes." A "green" cemetery requires that bodies not be embalmed or be embalmed with nontoxic fluid, caskets be biodegradable, and graves be marked only by simple, flat native stones, with or without engravings. Native vegetation also could be used to replace conventional gravestones. Some green cemeteries have plotted lots and others have randomly placed graves, which would be the case in Orrington. "Some people prefer a [traditional] burial, and some people prefer a natural burial, and some people prefer a burial at sea," said Peter Neal, spokesman for the Brunswick-based Maine Funeral Directors Association. "This is another option." As a cemetery, the green space would be protected forever from economic development. The land in Orrington is owned by retired nurse and schoolteacher Ellen Hills, 86, of Solon. She came up with the idea after reading an AARP article in July 2004. This is an article that appeared in the Bangor Daily News back in December. Thanks to the Haunted Maine mailing list for pointing it out! Here's an excerpt from the article; click on the "Source" link below to read it in its entirety. When Rick Glencross and Jenny Murphy tell you they serve fine food and spirits at The Fountain House, their restaurant on Main Street in Winterport, they bring a whole new meaning to the word spirits. The restaurant is housed in an old funeral home, which is creepy in its own right. But it’s also one of the oldest houses in Winterport, dating back to the mid-1800s. Capt. John Atwood, a seaman, lived there for many years with his family before James Foley opened a prominent funeral home there in the 1920s. The mortuary closed in 1992, and the place had fallen into disrepair by the time Murphy noticed it and peeked through its windows. "I fell in love with it," she said. "Initially, we were not going to mention the funeral home history, but then, when we got into the place and odd things happened, it became a thing." "Yeah, you know, like objects moving in the kitchen, lights going on and off, footsteps in an empty room, voices talking. You name it," Murphy said. And then there was the luminescent woman who walked by Rick Glencross one night when he was upstairs eating dinner on a TV table near the restaurant kitchen, which is on the second floor. "You mean Mehetabel?" said Glencross, using the name he has given the vaporous form that walked past, looking neither left nor right. "I’m 54 years old, and I’ve never seen anything like that. I knocked my TV table over to go take a look." It’s not as if Glencross and Murphy are trying to play down the spooky angle either. The restaurant décor includes posters of pop culture’s most nefarious and in some cases lovable characters, such as the team from "Ghostbusters," Elvira, Casper the Friendly Ghost, Herman Munster of the 1960s TV comedy "The Munsters" and Barnabas Collins, the vampire from another 1960s classic, "Dark Shadows." Black roses, Ouija boards — ghoulish kitsch of all sorts humorously ornament the walls. Every night but Monday, when the restaurant is closed, Glencross either performs — he’s a guitarist and singer — or presents musicians in an adjoining room called the "haunted pub." Its centerpiece is a glass coffee table containing a Victorian wicker viewing casket. The Fountain House, which is open at 4:30 p.m. Tuesday-Sunday, is located at 44 Main St. in Winterport. Dinner is served until 9 p.m. weeknights, 10 p.m. weekends. The haunted pub serves bar food beginning at 4:30 p.m. and stays open until after midnight on weekends. Dining reservations are recommended. FMI, call (207)223-4051.